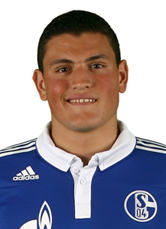 Dubbed as “the future of the Greece National Team”, Kyriakos Papadopoulos was born in Katerini, Greece and began his career at his local team of Svoronos Katerinis. His performances attracted the attention not only on a national level (as he got a chance to represent Greece at U-18 level), but also from big clubs such as Barcelona and Espanyol. Instead, he opted to remain in Greece by playing for the Greek giants Olympiakos and made his first team debut on the 2nd December 2007 as a substitute in the 3-1 win against Atromitos, making him the youngest player to compete in the Greek league at 15 years and 283 days old. However, Papadopoulos has only managed 12 appearances for Olympiakos in 3 years. He eventually was transferred to German side Schalke 04 for approximately €4m in June 2010, signing a 4 year contract. He initially played for the clubs youth team, as well as the Greek U-17s up to U-21s before being called up to play first team football for the club, being seen as back-up for the establish defenders in the club, most notably Christoph Metzelder. To date, he has racked up 47 appearances for the club and netted in two goals during his stint with the club. Most recently, Papadopoulos has been called up Greece National Team, scoring his first ever international goal in a 1-1 draw against Latvia. Described as a very confident player, Papadopoulos makes his presence known when he is defending. His size makes him a difficult player to compete with while in the air (wins around 3.1 aerial duels per game) and also helps him win 50/50 moments on the ball with an opposition player. His reading of the game is excellent, as well as his tackling at time, especially during key moments. Being a young player, you usually suffer from being “over-enthusiasm”, some may say. This is reflected in his relatively poor disciplinary record, with the young defender accumulating 16 yellow cards and 1 red card in around 45 appearances for Schalke (which is approximately 1 card every 3 games), 10 of those yellow cards have been from this season. However, in time this stat will be different as he is expected to be more calm and composed while tackling. Have any suggestions? Email us or tweet us!